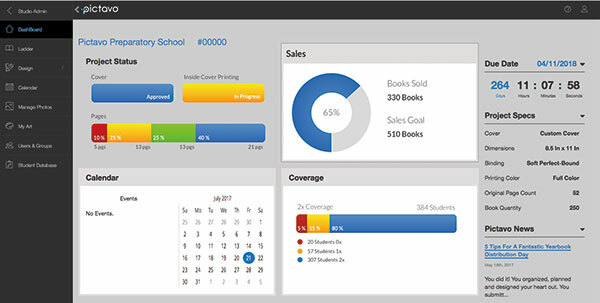 Creating a yearbook is easier with the right organizational tools. Pictavo enables you to create events, assign tasks and keep your staff on task via the dashboard. In Ladder view, see your book at a glance, assign pages and color code sections for even more organization. Work on the go with new mobile capabilities, Pictavo makes it possible to maximize every minute; and no one will know you aren’t in your classroom. Create unique portrait pages with completely customizable and adjustable portrait grid settings, then save your preferences to reuse on other pages. Build portrait pages before receiving images from your photographer, load your school’s portrait database on your own schedule, and flow—or re-flow—portraits with ease. No other yearbook software has an art library quite like ours. We’ve created collections with your entire book design in mind. Sophisticated templates, snippets, and style guides developed specifically for high school yearbooks make laying out a beautiful yearbook both possible and painless.